Look back through the years and learn about the outstanding preservation work of the locals who keep Ohio’s Appalachian Heritage alive. The honorees each year give a snapshot of some of the bright spots in Ohio’s Appalachian region. Follow the links for each year to watch a full video of the awards show and hear each honoree’s success story. In 2015, Tecumseh Outdoor Drama, Columbus Washboard Company, Weasel Boy Brewing, Ludowici Tile, Crumbs Bakery, Snowville Creamery, and Stewart’s Opera House told their success stories. The Emancipation Proclamation Celebration in Gallia County celebrated its 152nd year and its president, Andrew Gilmore talked about the hard work that brought their success. Jackie Welker talked about the road to creating the Pomeroy Blues Fest. Artist Alan Cottrill, whose bronze sculptures grace the sidewalk on Zanesville as well as a park in Shawnee, Ohio, the Artists of the Winding Road exhibit at the Decorative Arts Center of Ohio in Lancaster, and around the country, discussed his artistic journey and how his Appalachian heritage has shaped it. Anne Cornell also told the story of the Pomerene Center for the Arts‘ Coshocton Art Park, located across from the Coshocton County Courthouse. Statue of Thomas Edison by Alan Cottrill. The statue sits in Washington D.C., in Congress’ Statuary Hall Collection. Returning to the Statehouse atrium in 2014, attendees heard success stories from the Multicultural Genealogical Center, Millersburg Brewery, McClain High School, the Southeast Ohio Astronomical Society, and the John & Annie Glenn Museum Foundation. Attendees also heard about the heritage preservation that went into the beautiful Portsmouth murals on the 2,000 foot flood wall and in other parts of the city. Deana and Marvin Clark, the owners of the Ohio Valley Opry, talked about their successes in their 14th year owning and operating the opry located in the Twin City Opera House in McConnelsville. The Opry, which takes place on the third Saturday of every month, brings classic Appalachian music to Morgan County. The Statehouse Atrium also heard the success story of Bird Watcher’s Digest, started by a husband and wife in Marietta in 1978. The owner of the Marietta-based artist collective, Resolve Studios, talked about the art that celebrated Appalachian heritage. The award show in 2013 was moved into the larger Atrium space at the Ohio Statehouse. Attendees heard success stories from the Buckeye Hills Economic Development, the Marietta Main Street Project, Fairfield County Historical Parks, Casa Nueva Restaurant & Cantina, the Dennison Railroad Depot Museum, the Perry County Historical Society. Sunday Creek Watershed Group and Rural Action were honored and told the story of cleaning up acid mine drainage and their work to improve water quality. Ralph Alexander told the success story of the John T. Wilson Homestead, first giving a short summary of the incredible life of soldier, congressman, senator, and Adams County benefactor, John T. Wilson. His home has been beautifully preserved and functions as a bed & breakfast today. A sun catcher made form recycled bottles by the Glass ReFactory. Belmont Technical College’s preservation training program was also honored for producing preservation-trained graduates. Attendees also heard the success story of Georgetown, Ohio company, the Glass ReFactory, which uses recycled bottles to make sun catchers. Attendees also heard the success story of Rendville Artworks, located in Rendville, Ohio. In 2012, the Ohio Statehouse saw success stories from the Hocking College school of Natural Resources Dean Ken Bowald, who discussed the importance of interpretive guiding. Also sharing success stories were the Historic Fort Steuben, the Foundation for Appalachian Ohio, Zane State, the Main Street Downtown Revitalization Project, the Muskingum Watershed Conservancy District, the Zanesville Y Bridge Arts Festival and the Markay Cultural Arts Center. The Ancient Ohio Trail, a nonprofit organization dedicated to Ohio’s breathtaking Native American earth works, like the famous Serpent Mound, was honored and Paw Paw Festival Founder Chris Chmiel explained the wonders of Southeast Ohio’s darling fruit, the Paw Paw. ACEnet was honored yet again and Leslie Schaller, their current director, told the success story of the Athens Farmer’s Market. Stick around until the end of the awards and success stories to hear Julie Zickefoose, a nature artist and writer from Wipple, Ohio, describe in beautiful, poetic terms, what Appalachian Ohio means to her. Alma Hoops and her son Rick Crooks have made many numerous contributions to the arts in the Crooksville area of Perry County. A retired school principal and artist, Alma is not afraid to try new things. As owner of Collectors Art Gallery she organized a 20-acre Quilt Show that put the arts scene in the Crooksville area on the map. She is one of the organizers and leaders of the Crooksville Art Council which sponsors regular Arts Walks in this town that was once the pottery center of the United States. Most recently she has played a key role in forming a theater group for her county. Her son Rick Crooks is an accomplished metal sculptor whose whimsical works grace the Collector’s Art Gallery and many arts events that take place in southeastern Ohio. Overcoming blindness, Rick’s art work is not only popular among those who collect outdoor art, it is an inspiration to other artists who deal with physical handicaps. The Tecumseh Outdoor Drama portrays the epic life story of the legendary Shawnee leader as he struggles to defend his sacred homelands in the Ohio country during the late 1700’s. The huge outdoor stage of the Sugarloaf Mountain Amphitheatre in Chillicothe, Ohio affords the audience a unique viewing experience. Sheer spectacle surrounds you with a herd of galloping horses, live military cannon in action, and the most dazzling battle sequences offered live on the American stage. Tecumseh Outdoor Drama is in its 39th season and at 74 shows per season has already staged this theatrical production more than 2,800 times to over 2.4 million visitors. Tecumseh employs 60 actors and technicians at any given time and has afforded many an actor significant opportunities over almost four decadesThis professionally produced outdoor drama was written by seven-time Pulitzer Prize nominee and Emmy recipient; Allan W. Eckert. Tecumseh’sreputation for artistic excellence in performance, staging and design has garnered international acclaim. Other outdoor dramas have begun, enjoyed long runs and have expired while the Tecumseh Outdoor Drama continues to tell this important story of Ohio’s heritage. Founded in 1890, the Pioneer and Historical Society of Muskingum County is a small, membership-based, nonprofit organization committed to the principle that knowledge of its past is an essential element of a healthy and successful community. The organization is funded by the generous support of past and present donors but seeks to move forward with a strong collaborative effort that includes increased community and corporate involvement. Guided tours of our museums · A community outreach initiative, called “The History Has Left the Museum · A local history library and archives.· Lectures and other programs of historic interest are held on a regular basis at the Stone Academy, free of charge and open to the public.· Our publications, Historically Speaking and the Muskingum Journal, featuring articles about local history. A Military Room exhibit opened at the Dr. Increase Mathews House telling the many stories of men and women from Muskingum County who fought in our nations wars · In 2009, The 200th Anniversary of the Stone Academy: a Celebration of Local History included programs about the Underground Railroad, the early history of Putnam, architectural tours of the Putnam Historic District, special museum tours, guided tours of historic Woodlawn Cemetery · In 2010, P&HS led a community-wide recognition of the 200th anniversary of Zanesville’s days as Ohio’s second capital city. The Zanesville 1810 Project included a celebration weekend, a lecture series, a new self-guided tour of historic downtown Zanesville, · In 2011, the importance of the Stone Academy in the anti-slavery movement and Underground Railroad garnered national attention – after extensive documentation, the Academy was accepted by the National Parks Service for inclusion in the National Underground Railroad Network to Freedom. Founded in 1985, Muskingum County Community Foundation (MCCF) has granted $10 million to programs and projects in Muskingum County. Since Moving to the Putnam Historic District, the Community Foundation’s greatest impacts have been the renovation of an 1840s home into the Putnam Underground Railroad Education Center (the PURE Center) on Woodlawn Avenue, and the restoring of a dump site on the Muskingum River into a park similar to the Spangler Park that graced the space in the early 20th Century. The Community Foundation helped the Nelson T. Gant Foundation acquire the Gant Homestead on the National Road (Route 40) just west of the city line. This home was owned by an ex-slave who became a wealthy and highly regarded businessman and civic leader in the late 19th Century. The property is currently being renovated. The Community Foundation and Hocking College sponsored the creation of 100 seven foot tall Weller-inspired vases designed by Alan Cottrill. Most were sold at auction to provide an arts fund for local arts groups. Some are exhibited downtown and in Crooksville. The remaining vases are in a circle on West Main Street next to the Y Bridge on property donated to the Community Foundation. Near the vases at the confluence of Licking and Muskingum Rivers is the site of the first known trading post in Muskingum County. Nearby was the ferry that crossed the Muskingum River. The Y Bridge, rebuilt in 1984, is the home of the Y Bridge Arts Festival. August 5-6, 2011, is the third Festival. The first might have not taken place without a last minute donation from the Community Foundation. In 2008, the Community Foundation purchased Armco Park, a 40-acre park next to Ohio University Zanesville, and leased it for $1 a year to the Muskingum Family Y. The most recent project the Community Foundation has undertaken has been to raise $5 million for a new recreation center. MCCF acted as Fundraising Counsel for the 7-month campaign that reached its $5 million goal on June 29th. The Adams County Retired Teachers, Inc., an affiliate of the Ohio Retired Teachers Association, was first organized in 1948 and met for two years. Then in 1956, the group reorganized and they have met ever since, focusing their work on improving retirement benefits for their members, sharing information on local and state issues with their membership and the public, and awarding an annual scholarship of $500.00 to one student from Adams County who is pursuing a degree in Education. In addition to these efforts, several of their members were interested in purchasing and restoring a one room school house. In the early 2000’s, after spending a couple of years searching for a suitable school, they purchased Page One Room School on Vaughn Ridge and Page School Roads. The group spent several years restoring the school house, and now they maintain it as a museum for the education of the students and adults of Adams County. For their outstanding leadership and contributions toward the protection, preservation, and appropriate development of heritage, culture and sense of place in Ohio’s Hill Country, they are the recipient of Ohio’s Hill Country Heritage Area’s Heritage Award for Built Environment and Historic Preservation. Just seven families have owned the wooded ridge since a military officer named William Murphin claimed it more than 200 years ago. Sherry and Darryl McKenney gave up catering and sales careers to purchase the Murphin Ridge Inn in 1997. Along with their staff, the McKenney’s maintain 142-acres of rolling woodland and farmland that offer breathtaking vistas of the foothills that surround it. Not only can guests explore hiking trails and discover gorgeous waterfalls and the wonders of the natural world of Adams County, they can also enjoy the luxurious simplicity of the Inn’s accommodations and taste world-class cuisine offered in their historic dining house. The McKenney’s have also worked to preserve the Inn as an important historical site in Adams County in addition to making it a viable economic contributor to their community. Sherry and Darryl offer a wonderful place to stay and eat, while helping to promote the wealth of environmental, cultural and historic treasures Adams County has to offer. For their outstanding leadership and contributions toward the protection, preservation, and appropriate development of heritage, culture and sense of place in Ohio’s Hill Country. Success stories were also told at the 2011 Awards, and after opening remarks from the two sponsoring organizations, Heritage Ohio and Ohio’s Hill Country Heritage Area, the first award was given to Athens County Convention & Visitor’s Bureau, and Executive Director Paige Alost explained the success of the 30-mile meal. The next award went to the Colony Theater in Marietta, which saw extensive renovations leading up to the awards, as explained by the theater’s Director of Development, Hunt Brawley. Other 2011 awardees and success stories were the Morgan County Convention & Visitor’s Bureau, the Muskingum County Community Center, Appalachian Center for Entrepreneurs (ACEnet), the Little Cities of Black Diamonds, the Hocking Hills Tourism Association, the Arc of Appalachia Nature Preserve. The town of Somerset, and Mayor Tom Johnson were honored for the efforts to preserve the many historic buildings in the former county seat for Perry County. From the 1960’s to the early years of the new century Jim and Gwen Young gave readily of their time and talents to improve the place where they live. Jim, a farmer who’s family farm sits right on the terminal moraine where Ohio’s farmland meets hill country. In addition to being a great experimenter with agricultural practices, Jim devoted much of his spare time to conservation efforts with the Rush Creek Conservancy District. Although highly knowledgeable and a good conversationalist, Jim was not one to be seen at most public affairs in Perry County, his wife Gwen, however was the vibrant face to be found wherever there was a community improvement effort afoot. A native Texan with a heart and personality as big as her home state Gwen Young came to Somerset to her husband’s family farm upon marriage and launched a teaching career with the Northern Local School District. She loved learning and wanted to teach others. Among her many outlets for this passion beyond the classroom were the Perry County Historical Society and Perry County District Library where she constantly volunteered, promoted learning and served as ambassador for these institutions which were struggling for their very existence before Gwen rallied citizens from around the county to these services. Upon retirement from teaching Gwen was elected mayor of Somerset and led efforts to restore this early Ohio community which was located along Zane’s Trace, and was most notably home to Civil War General Phillip Sheridan. Among her accomplishments were the purchase and restoration of one of Somerset’s early brick residences for conversion into today’s Perry County History Museum. Gwen was a driving force in the early days for what has become a successful restoration of the historic Somerset Court House which once served as the County Courthouse until the county seat moved south to New Lexington, and is believed to be the oldest standing courthouse in Ohio. In 1980, Gwen led a successful effort by the Perry County Historical Society to create a modern day genealogical history of Perry County as told by dozens of family who submitted their stories. A science teacher, Gwen also loved nature and volunteered many hours to the nearby Dawes Aboretum where she led many programs for youth and the public. Although there are many tangible accomplishments that can be attributed to Gwen, the most difficult to describe is her positive attitude and her ability to bring people of diverse communities and beliefs together for the common good. In a county with well over a dozen distinct communities that often have trouble getting along, Gwen could be counted on for attending any event that was promoting a civic project, encouraging the organizers every step of the way. Gwen was vigilant in developing assets and had no time for negativity. In a county that is most notably divided by the geography of flatlanders to the north and hill folk to the south, Gwen transcended the resentments and bickering that often cripple Perry County, always looking for and supporting the good work of each community and person regardless of stereotypes. After nearly a decade break from life in Perry County volunteering as docents in national parks as they traveled the country in their camper, the Youngs returned home to Somerset in 2010. Now well into their 80’s, they are still vibrant and lead by example contributing in constructive ways to their family and to whomever they meet along the way. Martha Burton has spent the last four decades as a passionate advocate for the arts and heritage in Ohio and especially in her beloved southern Ohio. Martha and her late husband Everett, were raised in Portsmouth and met in high school. Martha first became involved in the arts back in 1970, when she was involved in the founding of the Portsmouth Arts Council; she co-chaired the initial fundraising campaign to establish the Southern Ohio Museum, one of the state’s premier cultural institutions; and went on to serve on the board and as president of the Museum. Martha was involved in local historic preservation efforts as well, and was an early advocate for the Boneyfiddle Historic District, as well as individual landmarks in Portsmouth. While her activities in Portsmouth alone would make her worthy of an award, she didn’t stop there. She has had an impact on the entire state. Martha was appointed to serve on the Ohio Arts Council by Gov. Voinovich in 1991 and has been an extremely active member ever since. She has also served on the Ohio Historic Site Preservation Advisory Board, which reviews all National Register nominations for the State of Ohio. Martha became actively involved in the formation of Ohio’s Hill Country Heritage Area as a member of the Ohio Arts Council. She attended dozens of early planning meetings and offered her sound advice; she used her persuasive skills to encourage others to become involved; and she did whatever she was asked to do to make sure that the program was established and would be successful when it was spun off from the Ohio Arts Council to become an independent non-profit organization. Martha relocated to Worthington, here in central Ohio, in 2008. True to form, she has become actively involved in the cultural life of her new home and now serves on the board of the newly-opened McConnell Arts Center. Martha, thank you for all you have done, to make people aware of Ohio’s rich cultural life – past, present and future. Thank you, too, for believing in the idea of Ohio’s Hill Country Heritage Area and for giving so much to make sure that it became a reality. Pat Henahan has a true love for Ohio’s Hill Country. Raised in a military family, Pat lived in a number of states before her family moved to Lancaster, Ohio when she was in high school. She is a graduate of Ohio University with a degree in design. Following work in retail planning in the private sector, Pat found her calling when she joined the Ohio Arts Council as a staff member in 1986. Over the past 24 years, she has helped countless arts and heritage organizations to realize their potential. She served for many years as the Design Arts Coordinator and she was the person at the Ohio Arts Council who thought outside the box and imagined the creation of a heritage area in Ohio’s Hill Country. Beginning with attendance at a conference at Roscoe Village in the mid-1990s and becoming familiar with the work of others in the region, including First Lady Francis Strickland’s early efforts to define the opportunities for heritage tourism; and Dr. Lorle Porter’s early books about the rich history of the state’s Appalachian region, Pat convinced then director, Dr. Wayne Lawson, to put a line item in the OAC budget to undertake a new program. In addition to her other responsibilities at the Arts Council, Pat worked overtime to involve hundreds of individuals, dozens of organizations, and every state agency she could think of to be part of the conversation about how heritage and culture could become the foundation for economic development in the region. Over the last few years, Pat’s work responsibilities have been focused in northwest Ohio, but we were all delighted to hear that she has now been given responsibility for southeastern Ohio again, as well. Pat, thank you for thinking about our area of the state and going out on limb to propose a new program for the Ohio Arts Council; for taking the organization through its infancy and facilitating is formation as an independent non-profit organization. Pat, welcome back to the region – we all look forward to our continued collaboration with you and the Ohio Arts Council. The Belpre Historical Society is one of the best examples in our region of an active community historical society that impacts the community in which it exists by collecting and sharing its important stories through a series of annual events. A variety of exhibits in their museum range in interpreting stories of this early Ohio River community before statehood to its role in the Underground Railroad. Sustained leadership from the organization’s leader Nancy Sams, as well many other long time members is a perfect reminder of the importance of having people in community organizations that are in it for the long haul. One can follow blue blazes from Lake Erie to the Ohio River and back in a circuitous path that traverses Ohio’s glaciated and unglaciated plateaus, the glacial till plain and the Kentucky Bluegrass in southern Ohio. This extraordinary undertaking was begun in 1959 and through a widespread volunteer effort agreements have been reached with property owners and trails have been constructed that allow hikers to experience all aspects of Ohio’s natural and cultural history. Hikers can pick up the trail at Mentor Headlands Beach on Lake Erie and explore regions of Ohio’s Connecticut Western Reserve or follow the Ohio-Erie Canal towpath through parts of Summit County. The trail takes hikers for walks along many of Ohio’s streams and through its finest natural areas. In western Ohio hikers can explore the Great Black Swamp, the Miami-Erie Canal and head south into Ohio River Country. The Trail takes visitors through state parks and wildlife areas, across farmlands and past Native American earthworks, pioneer heritage sites in a 1444-mile odyssey and becomes one of Ohio’s great heritage resources in the process. The Buckeye Trail Association recently restored and old Ohio barn and converted it from generations of agricultural use to a meeting center and hostel for hikers in Harrison County. The Buckeye Trail association has involved thousands of volunteers in its efforts over a fifty year period and the result has served tens of thousands of hikers and visitors and introduced them to some of Ohio’s best places. This monumental effort has earned the Buckeye Trail Association recognition with Ohio’s Hill Country Heritage Area’s Community Heritage Award and its Built Environment Award. After 27 years of teaching first grade, Thornville Elementary School teacher Joanne Hoover turned in her pencils and notebooks and took up presidency. Throughout her teaching years the single mother had little free time. “The minute” she retired, Hoover joined the Perry County Historical Society in 1990 and has since helped the organization rise to success. Recently Hoover was awarded a Lifetime Achievement Award from Ohio’s Hill Country Heritage Area for her leadership in heritage preservation in Perry County. In 1952, then Joanne Sessum graduated from Somerset High School as the valedictorian. She planned to attend Ohio University the following fall to pursue her dream of becoming a teacher, like her mother. But, dreams of dormitories and lecture classes were soon left behind. A full-time job at the local hardware store became the reality. Hoover’s father was injured while working as an operator at Sunny Hill Coal Co. The money that would have been used to pay Hoover’s way through Ohio University was instead used to support the family and to pay for hospital care. Hoover was the oldest of three children so she was aware that there were other mouths to feed. “So I just started working,” she said. When she was not working at the hardware store, Hoover passed time in Somerset taking photographs on her brownie camera. “When I think about it now, this is what got me interested in history,” Hoover said. A few years later a mutual friend introduced her to the man who would be her husband and with whom she would travel to the Florida Keys for a secretarial job at a naval base. During this time she visited Ernest Hemmingway’s home where Hoover said she began to develop a more hands-on interest in history. The family later returned to Somerset. Hoover decided it was finally time she realize her life-long goal of becoming a teacher. It was 1962 and Ohio was in the midst of a major teacher shortage. Hoover enrolled in the Ohio’s Teacher Cadet Program, a crash course to teaching. With just two years of training and no field experience, Hoover began teaching first grade in Thornville. Her daughter Gwendlyn, then having just completed first grade, taught Joanne the manuscript printing that she was required to teach her own students. “She was a very strict teacher,” Hoover said. In 1990 Hoover retired from teaching and joined the Perry County Historical Society to pursue another life-long love; history. Within two years of joining, Hoover worked her way up the ranks of the historical society to the role of president..
As president, Hoover’s most exciting event was when the Society discovered and purchased the Jacob Miller’s Tavern. The tavern, built in 1807, originally served pioneers of the region as what we would call today a bed and breakfast. Over the years the building was sold and re-sold until it was eventually threatened with development. Perry County Historical Society members have ensured that the oldest log tavern in Ohio will be saved for future generations. “Once we get it [the tavern] uncovered by removing the wood siding an exposing the hewn logs,” Hoover said. Recently Hoover was awarded for her twenty years of service to Perry County. Ohio’s Hill Country Heritage Area, a non-profit organization which seeks to identify, protect and develop the natural, cultural, recreational and economic resources in Appalachian Ohio, awarded Hoover with its prestigious Heritage Award in Lifetime Achievement. “I feel honored, but undeserving. There are so many other people who deserve this,” Hoover said. Though she has had many personal and professional achievements with the Perry County Historical Society, Hoover is most proud that the society still maintains its museum building in Somerset. When membership dwindled, the society thought it would fold and lose its building. Hoover helped to raise membership from three to 85 and raised funds so the society would not lose its meeting place. She constructed a fundraiser to sell decks of playing cards decorated with historical sites from the county. “I canvassed the whole county asking for $50 per card sponsor and we didn’t lose our building,” Hoover said. “That might be the contribution I’m most proud of.” Hoover said. Brad Bond has made substantial contributions to the understanding and dissemination of Ohio’s early heritage. Brad researched and wrote the book, Grindstone Country, which tells the story of the quarrying and shaping of enormous grindstones from the sedimentary bedrock of Washington and Athens counties and their means of shipment to factories where many of the agricultural implements were being manufactured in the Midwest during the nation’s rise to world leadership in agricultural output. These grindstones were used to sharpen the newly manufactures plow blades and sythes and numerous other steel implements and well as other tools used throughout early industrial processes. Brad Bond was the editor of Towpaths, the Ohio Canal Society’s quarterly newsletter, for more than a decade. While serving as editor he also wrote numerous articles on the history of Ohio’s Canals and the many engineering wonders performed by the canal builders connecting Lake Erie and the Ohio River and connecting Ohio’s heartland with the markets in the east and south. Brad Bond also served with the Ohio Coleopterists Society, a non-profit organization whose purpose is to enhance understanding of and promote interest in beetles of Ohio. Brad also volunteered with data collection for the Bird Trail in Washington County, volunteered for the Outdoor Education programs in the Marietta City School District, and has been a long time member and volunteer with the Marietta Area Recycling effort which has been in continuous operation since 1976. Brad Bond’s contributions toward Ohio’s natural, cultural, and historical resources stands out and has earned him Ohio’s Hill County Heritage Area’s History and Environment Heritage Award. Gifford Doxsee has served as a founder and long-time member of the board of the Athens County Historical Society and Museum. No longer a board member, Gifford continues to serve on various committees and as a representative of the Society to other organizations and government. He has been an active contributor to the newly opened Glenford Dugan Athens County Military Museum in Nelsonville. A prisoner of War in Dresden, Germany during World War II, Gifford finds time to talk with students and many other groups about his experiences and participates in state and national POW support organizations. Gifford was a long time member of the Ohio University Ecology and Energy Conservation Committee and helped direct energy conservation on campus reaching back into the early 1970’s. Gifford has volunteered his services as a Rural Action board member and has made generous financial contributions toward that organization’s goals of sustainable living. Gifford has also been a strong supporter and active member of the Multi-Cultural Genealogical Center in Chesterhill, Ohio. Gifford has given his time to work with inmates at the Chillicothe Correctional facility. Gifford has been a long time supporter and contributor to Ohio’s Hill Country Heritage Area’s efforts. Gifford Doxsee is indeed a model citizen that sets a good example and inspires others. Like many of his generation his is a hard act to follow. Ripley Heritage, Inc. was established in 1975 in preparation for the U.S. Bicentennial. In 1976, this all-volunteer non-profit became the management agent for the Ohio Historical Society to manage and operate the historic Rankin House, a National Historic Landmark and an important stop on the Underground Railroad in southern Ohio. From 1825 to 1865 John Rankin, a Presbyterian minister and educator, sheltered and helped feed more than 2000 slaves escaping to freedom with as many as a dozen escapees being hidden in the home at one time. Ripley Heritage, Inc. also manages the Ripley Museum and all of its artifacts and has been a very visible part of the historic preservation efforts in Ripley, Ohio. They remain and inspirational group whose work with historic preservation and conservation is noted throughout the region and serves to benefit all Ohioans and American citizens. Ripley Heritage, Inc. is an example of a small group of citizens taking responsibility for protecting and promoting local heritage within their own community and for visitors from well beyond Ohio’s Hill Country. Sorghum making began on the John Simon farm in 1982 when the old local sorghum maker, Elbert Hackworth who had been making it since 1915, taught him how to do it. The Sorghum Festival has continued for 25 years on John Simon’s 5th generation family farm. Sorghum is 100% natural syrup made from the sorghum cane – nothing added – and it was the leading sweetener in America in the mid 1800’s. Preservation of this part of the hill country heritage is supplemented with traditional Appalachian acoustical string music, crafts, pumpkin and squash picking, apple-butter making, wagon rides pulled by Percheron horses, basket weaving, quilts, kids games, and making of grapevine wreaths, traditional toys, furniture and soap. Mr. Simon also offers fieldtrips for school children at his farm. John Simon is preserving many aspects of Ohio’s hill country heritage through his annual festival and is preserving an important part of Ohio’s historic landscape and agricultural heritage. Much would be lost without inspired folks like John Simon and the people who participate in the Sorghum Festival. A non-profit business joining together the old and the new – old time skills and craftsmanship of glass work with the new fashioned inspiration of business and individuals involved in environmental sustainability. Recycled glass bottles salvaged from the waste stream are hand-crafted into sun catchers, artistic pieces made and designed to specifications and used by groups and organizations to promote their efforts. As a non-profit business, both economically and environmentally responsible to their community, they serve four Appalachian counties in Ohio’s hill country. The Glass Refactory is part of a recycling program that provides both income and recycling opportunities to area residents. This is an inspiration for government and business leaders to support the establishment of more and varied sustainable and environmentally friendly business opportunities. The Highlands Nature Sanctuary, organized in 1995, bought land in Ohio’s Hill Country in a solo attempt at nature preservation. Their mission is to buy and save a sizeable fragment of the Eastern Deciduous Forest in one of the most populated places on the continent and, in a way that may serve as a model to inspire others. The Highlands Nature Sanctuary enlists the support of volunteers and donors to advance their mission to bring back old growth forest to Ohio, create a refuge of zoological diversity, and save the best of the remaining botanical treasures in south-central Ohio along the Arc of Appalachia. With the inspiration of Larry and Nancy Henry the Highlands Nature Sanctuary has raised hundreds of thousands of dollars and purchased for long term protection the breathtakingly beautiful 7 Caves, a hundred year old historic park, and more than 40 other properties in and around the scenic Rocky Fork Gorge. This monumental undertaking and history making endeavor would not have been possible without the foresight and courage of extraordinary citizens like Larry and Nancy Henry and their cadre of supporters. The Portsmouth floodwall murals, initiated in 1992 with the inspiration of local resident Dr. Louis Chaboudy and his wife Ava, is an impressive expression of the history and heritage of the people, the industry and the character of the city of Portsmouth and the surrounding region. A committee of volunteers has transformed the city’s floodwall into a beautiful outdoor gallery of 52 twenty foot high images that extend more than 2,000 feet along Front Street and the Ohio River. Floodwall beautification is an ongoing endeavor of Portsmouth Murals, Inc. – a non-profit, all-volunteer organization. Additional murals are in the works for another section of the floodwall. This enormous effort is supported by funds from public and private grants, fundraising events, and corporate and individual contributions. The result is a heritage treasure that allows many to help and engenders pride throughout the community. The floodwall mural is a very visible reminder of our past and an inspiration to us all for the future. Built in 1969, the “Big Muskie”, once the world’s largest earth moving machine, could move 39 million pounds of earth and rock every hour. In 1999 the Big Muskie was dismantled for scrap and high explosives were used to blow off its 5 inch thick cables. Fortunately, Muskie’s owner, American Electric Power, turned the remaining giant bucket into the centerpiece of en educational display informing visitors about Big Muskie, surface mining and reclamation, and to memorialize the men and women who helped mine and reclaim the land. Today the bucket sits on a rise, overlooking the beautiful valley that it once mined and destroyed, which has been renamed “Re-creation Land”. The gigantic Big Muskie bucket is an important but very small part of an industry that had enormous impact on the lives of the people and the land of Ohio’s Hill Country. Dubbed “The People’s Project” by one of its founders, Old Fort Steuben was initiated by and for the people of Steubenville. Their efforts at fundraising and construction, planning and advertising, and maintaining this unique site have given the community an educational attraction that welcomes hundreds of schoolchildren, senior citizens and visitors from far and wide. Old Fort Steuben stands as a tribute to the initiative and loyalty of concerned local citizens and as an example for other cities to follow. Built in 1823, the Chester Courthouse is Ohio’s oldest standing courthouse. As the current home of the Appalachian Heritage Center, the Courthouse is a repository of local history, genealogy, folk lore and artifacts. The Chester – Shade Historical Association, who oversaw the Courthouse’s restoration between 1995 and 2001 currently administers various educational, historical, period skills, cooking, crafts classes and programs at the courthouse. The Courthouse, which offers a gift shop and rotating display is often the site for community activities, research programs, mock trials, and serves as a community meeting house. This beautifully restored historic building is the work of many citizen volunteers who are very proud of their heritage and of this historic Ohio landmark’s presence in their community. Their community’s effort stands as a symbol of the pride they take in being stewards of the legacy of Ohio’s pioneers. The Artisan Center at Maple Creek was established to provide traditional artists with a permanent location to display, promote and demonstrate their crafts and to provide clients with a beautiful, unique location where they can find traditional handcrafted work for their homes, families and friends. With these thoughts for inspiration the owners restored an historic log barn to create a large gallery to house the artisan center. It is the perfect place to meet artisans and watch them demonstrate their crafts and browse the gallery for one-of-a-kind gifts. The Artisan Center offers classes in blacksmithing, broom and basket making, pottery, cabinetry, glasswork, textiles, woodworking and other skills. The success of their efforts is a tribute to their entrepreneurial spirit and their recognition of heritage as a basis for the foundation of their business venture. The Dennison Depot, built in 1873 and listed on the National Register of Historic Places, stands as a proud symbol of Dennison’s vast railroad heritage. Purchased by the Village of Dennison in 1984, the depot has been restored by a strong grassroots volunteer group and reopened in the memory of the many railroad employees, servicemen and women, and travelers who passed through its doors. Exactly halfway between Columbus, Ohio and Pittsburgh , Pennsylvania made it the ideal location for a large railroad facility with a history which includes its vital role in the disbursement of troops during World War II who enjoyed the coffee and food offered in a Salvation Army Servicemen’s Canteen and earned it the nickname “Dreamsville, Ohio”. The museum now houses a museum, restaurant and gift shop opened year around and continues to offer hospitality and welcome visitors after a nearly $1 million renovation. Again, the work of volunteers and the importance of this structure to its community has preserved another part of Ohio’s Hill Country heritage for us all. As a young post war immigrant from Germany in the early 1950’s, Hubert’s introduction to the American landscape inspired him to pursue a career as a professor of cultural geography. This pursuit brought him to the heart of Ohio’s Hill Country to teach settlement geography at Ohio University where he sought to unravel the history of the American story by studying the characteristics of the built environment in the former wilderness of southeast Ohio. The artifacts of buildings and land use helped him to unlock the mystery of its many and varied stories which he enthusiastically imparted to many students from places over his career. Dr. Wilhelm’s research and investigation of the various cultures from New England, Pennsylvania, the coastal plains, the post Civil War south, and returnees from the west coast who each brought their cultural baggage and institutionalized these characteristics as artifacts of Ohio’s landscape inspired him to dub Ohio as “America’s Cultural Hearth”. Hubert’s legacy is marked by his love of the ground truth and his enthusiasm in sharing it and inspiring or infecting others who carry on his work. The Greenfield Historical Society, formed in 1949, is non-profit and exists to further historical preservation and education in Greenfield, Ohio and the surrounding area. The Greenfield Historical Society currently owns and manages Travelers Rest, the first stone house built in Greenfield in 1812, which serves as a museum and the organization’s headquarters. The Society also owns and operates the B&O Railroad Depot, once an active transportation hub; the Samuel Smith Tannery, built in 1821, the oldest existing tannery in the state of Ohio and a stop on the Underground Railroad; Greenfield Hay and Grain, a building complex that played a major role in providing farm and hardware products to area residents for several decades; and the Old Seceders Presbyterian Church which once served as an early two-room schoolhouse. The Greenfield Historical Society has long recognized its rich heritage and has made a substantial effort to collect, preserve and interpret archival materials and artifacts indigenous to Greenfield region. They have encouraged historical research, sponsored historical programs, displays and special events, and have been concerned with the preservation of historic buildings and have cooperated with other organizations in these efforts. The Greenfield Historical Society stands as a premier example of what can be done by caring citizens and their results are an indication of the rich history that makes up the many communities throughout Ohio’s Hill Country. The Daily Grind Café is a comfortable, upscale, urban feeling coffee shop in the quaint downtown area of New Philadelphia across from the Quaker discount movie theater. Located in an historic Italianate structure featuring window hoods with keystones and brick cornices built in 1880, formerly a bakery, the atmosphere inside includes an old fashioned lunch counter, an antique deli display, and comfortable seating from couch to kitchen table to café booths. The Daily Grind Café has become a popular meeting and eating place while its owners have contributed to the renovation of old buildings and the revitalization of a small town’s main street. The owners of the Daily Grind Café are dedicated to the redevelopment of the downtown to the extent that they have moved in above their business as was traditional in times past. As its reputation spreads it is becoming a stopping place and even a destination for travelers. The Daily Grind Café is an example of a local business recognizing the benefits of a community’s heritage as an asset and a strength in the development of a new enterprise. Currently, the Heritage Homes Association of Tuscarawas County is working on a historical designation for downtown New Philadelphia which has been inspired by local efforts such as those demonstrated by the Daily Grind Café. The return of Morgan’s Raid Reenactment in 2006 was made possible by the tremendous efforts and contributions of local citizen volunteers and organizations, businesses, and landowners, of which there were many. The Morgan’s Raid effort included 350 to 400 Calvary and infantry reenactors from close to thirty states, some from as far away as California. The event also included the participation of more than 200 horses. This enormous endeavor required tremendous support from landowners and local people who helped feed and house both the participants and their livestock. The Buffington Island Battlefield in Meigs County is the site of the only Civil War battle in the state of Ohio. In addition to the recreation of the historic battle the reenactors performed educational activities for school children, set up a Civil War campsite and conducted a Civil War era ball. However, there would be no reenactment without the enthusiastic participation, leadership and organizational efforts of Darrel Markijohn, who represented Colonel John Hunt Morgan, and reenactors Bob Vance and Ed Sharp. The interest and commitment of these individuals and other reenactors in bringing to life the events of this historic period, attended by exceptional levels of authenticity in period garb, weapons and all other civil war artifacts employed, resulted in an historic phenomenon of great educational and economic opportunity for the region. For the reenactors’ who have come so far and for their enthusiasm in telling the story about this significant piece Ohio’s heritage and an important part of our nation’s history we present this award to say thank you. For approximately 20 years, Robert McInturf has served as president of the Morgan County Historical Society and Museum in McConnelsville Ohio. The society got its start when Mrs. Evelyn True Button (1875-1975), great granddaughter of General Robert McConnel, bequeathed her 1836 Federal Home to the society to become a house museum. Donations of artifacts, either too large or inappropriate for display in the house led Robert to realize the need for a museum. He oversaw fund raising approximately $400,000 and the purchase of a large turn of the century two story Dover Store Building. The dream was realized due to Robert’s efforts in 2001 with the grand opening of the Morgan County Historical Society Museum—one of the finest museum facilities in the State of Ohio. In addition, Robert is responsible for moving and preserving the 1877 one room Rock Hollow School to Malta. The historic school building, originally located on a country road, was subject to vandalism with no neighbors in sight. Thanks to Mr. McIntruf the old school remains as an important part of the Morgan County’s heritage and our regional history. Dr. Robert N. Richmond came to Morgan County as the new veterinarian in 1961 and still has a full time practice. He wasn’t long in getting involved in the Morgan County Historical Society which started as a small nucleus of interested people and has now become the owner of the original Now & Then Shop, the Button House, and the newly opened Historical Society Museum and several other buildings. He has been president and is currently on the Board of Trustees. One major project was moving the Rock Hollow one room schoolhouse from its country location to a new location in Malta and there have been many other projects over the years. In 1988 the Civil War Encampment Days was started, became a part of the Historical Society for a few years and then was taken over by the Morgan County Re-enactors Association, Inc. with Dr. Richmond as president. This has been a continuous 3 day weekend event in Malta and McConnelsville since that time with emphasis on education as well as tourism. Dr. Richmond has also been very active in the Opera House Theater in McConnelsville which has been in continuous operation since its beginning in 1890. For the last several years he has been president of the Board of Trustees and instrumental in improving the inside of the theater, opening up the original orchestra pit with new railings and making a handicap accessible ramp. In addition to the weekly movie 4 times a week, there has been an effort to provide all kinds of entertainment from blue grass to dance recitals and professional musicians brought in from other places. This “Gem of Morgan County” as he calls it draws people from all over the area. In addition, Dr. Richmond is also president of the Kate Love Simpson/Morgan County Library Board, a member of the Airport Authority for Morgan County Airport, the Malta-McConnelsville Rotary Club, the Chamber of Commerce, and an active member of his church. Stephanie initiated the idea of the Patchwork Jewels of Monroe County in March 2004 after learning about the quilt barn project in Adams County. Stephanie identified partners, coordinated the effort, leveraged funding, and formed a committee with representatives from the Monroe Arts Council, Monroe County Historical Society, four area quilt shop owners/quilters and the Monroe County Tourism director who saw the project to its completion with the production of a beautiful brochure highlighting the quilt barn project. Most quilt patterns were chosen to relate to the history of Monroe County and to showcase Appalachian heritage. The painter for the project was Scott Hagan who painted all of the Ohio Bicentennial Barns. The quilt squares were painted directly on wooden barns and range in size from eight to fourteen feet. The main objective of the project was to bring people into the county, and now thanks to Stephanie and her vision for her community, anyone who can ride in a vehicle can enjoy the project but they also visit other focal points, eat, shop and some even stay over night. This has an impact on Monroe County’s economy. Besides being a busy and distinguished professor of music at Ohio University Dr. Wetzel has been the mayor of Chesterhill since 1983. He has also been quite busy as an active citizen in his community for many years. He has been instrumental in the creation of a community park on land where an old school building once stood. A hands on community effort with many volunteers. He organized a restoration committee for the Union Hall Theater building that was built in 1908 in a joint effort (a union) between the village and township. It had been unused and in disrepair for many years. The beautifully constructed building is currently going through a step-by-step restoration. Recently a grant was acquired that made it possible for heating and air conditioning to be added. What was once an idle second floor theater is now a very active part of the community of Chesterhill and surrounding township being used to show films for children, to accommodate library functions and theatrical events including the recent appearance of an Elvis Impersonator. Because of his leadership and hands-on efforts to move walls and dirt, the community library which is house on the first floor was expanded to become one of the busiest libraries in the area. Dr. Wetzel also serves on the board of the non-profit Multicultural Genealogical Center in Chesterhill. He is truly an inspiration in his community and often the spark that gets things going in a positive direction. Delmar was born in his grandmother’s house in rural Pike County, Ohio and has been a life-long resident. His career in education was mostly with the Waverly City Schools where he served as teacher, principal, elementary supervisor, assistant superintendent, substitute bus driver, treasurer and Drama Club Advisor. He directed eleven productions with the Drama Club, two of which he authored, and since retiring has written two more for them. To honor Ohio’s bicentennial, Delmar wrote, directed and produced “The Waverly Trilogy” which was staged at Pike Heritage Foundation, Inc. (Museum) for the historical and financial benefit of the museum. The cast and crew presented 22 performances, 21 of which were sold out. Everyone connected with this endeavor was a volunteer, with approximately 60,000 hours volunteered by community members throughout Pike County. The museum realized a financial gain of $19,788. This activity also brought many new people to the museum to learn the history and heritage of Pike County. Delmar always brings out the best qualities of the people with whom he is associated. He is currently writing, directing and producing a drama recounting the story of a murder in what is now the small village of Omega, near Waverly. Proceeds again are directed to the Pike Heritage Foundation, Inc. In February 1987, Lora Lynn Snow conceived of forming a professional orchestra in Gallia County and basing its performances in the Ariel Theater in Gallipolis Ohio. She spearheaded the restoration of the historic opera house, which had been abandoned, and was the moving force behind the creation of the Ohio Valley Symphony. She later expanded her efforts to helping establish the After School String Project, the Ohio Valley Youth Orchestra, the Ariel Dancers and the Ariel Players. In recent times, she has worked tirelessly to have the entire building, which housed the Theatre, purchased by Ann Carson Dater. Mrs. Dater is formerly a resident of Meigs County. This purchase opens up unprecedented opportunities for the performing arts in Ohio’s Hill Country. Lora Snow has been a catalyst for the continuing evolvement of the Ariel Ann Dater Performing Arts Centre. Christine Far was trained in dance and has had the opportunity to perform in many of the fine places in the world, from New York to Paris and beyond. However, Christine has chosen to devote her talents to people right here in Ohio’s Hill Country. Christine has worked with local citizens and has helped them achieve starring roles in numerous local dance productions and recitals. Christine has worked with boys and girls, moms and dads, preschoolers, teenagers, their parents and others and has helped these people discover their own hidden talents. Village Productions, centered in the old Grange Hall in Amesville, Ohio, has been the setting for many of these fine performances. Village Production has had to depend on the creative talents and the volunteer support of local community members and has staged professional quality performances of the Nutcracker during the holidays and has had her troupe perform on stage at the Stuart’s Opera House in Nelsonville. The Hocking Valley Scenic Railway (HVSRy) was established in 1972 at Nelsonville, following abandonment of a section of rail, then known as the Hocking Division, by the Chesapeake & Ohio Railroad. The rail line between Nelsonville and Columbus was originally built in 1869 and went through several ownerships and name changes before its acquisition by the C&O when it was named the Hocking Valley Railroad. The rail yard at Nelsonville was 32 tracks wide and was, at one time, one of the busiest in the country, serving the more than 50 coal mines operating in the area, as well as salt mines and the thriving brick-making industry. The Hocking Valley Scenic Railway is a 501C-3, all volunteer, non-profit organization. It now operates over 12 miles of track extending from Hocking College to near Logan. From May through December, trains run twice each day, Saturday and Sunday, for the enjoyment of the general public. The volunteers run the trains, are responsible for maintenance and restoration of the vintage equipment and also maintain the track and structures. Most of the very active members are retirees often referred to as the “Geezer Gang”. During the past several years, the scenic railway has transported in excess of 20,000 visitors annually and has been ranked #1 by both the Athens County Convention & Visitors Bureau and the Hocking County Tourism Bureau in website inquiries. In 1999, the Hocking Valley Scenic Railway, with the assistance of a grant from the State of Ohio, erected a new, three track engine house. There are now five diesel engines in the HVSRy stable including a WWII Whitcomb engine which is believed to have seen service in Italy. It was a restoration project that presented many challenges. The large steam engine, #33, could not be operated because of federal regulations requiring that the boiler be rebuilt and it was traded to the Ohio Central Railroad for another diesel engine. A much smaller steam engine is in the early stages of restoration. Also being restored is a relatively modern B&O passenger car which, will provide high back seats, rest room and air-conditioning. Since its formation in 1984, the Toronto Beautification Committee (TBC) has served the city of Toronto, Ohio, population 6000. An all-volunteer organization, this committee has developed 12 city owned parcels of weed-infested land into parks, green spaces and pedestrian oriented pockets of pride from one end of the city to the other. Both entrances to town are graced with beautiful “Welcome to Toronto” signs, and each city site has a captain who is responsible for organizing their own volunteers for maintenance, seasonal decorating and general appearance. Funds for site improvements and maintenance are raised through annual corporate sponsorships. Although the committees’ city budget allocation has been eliminated, the group of more than 20 volunteers has continued to renew their commitment and sought alternative funding through geranium and planter sales, private donations and grant money. In 2004, TBC restored a 1919 WWI Beaux Arts style statue and worked to have it placed on the National Register of Historic Places. They went on to completely renovate the Veterans Victory Pavilion honoring all who have served our country. The park and pavilion offer the visitor a place to rest and serve as a gathering place for civic, patriotic and celebration events. No city funding was sought or used. In July 2005 the committee launched Operation Sparkle, a program to keep the community clean. Volunteers and volunteer organizations are assigned specific areas of the community and are responsible for maintaining them free of litter. This committee has become a model for communities all over Jefferson County; ordinary citizens are taking responsibility for the appearance, spirit and future of the community where they live. Stuart’s Opera House is the cornerstone of the Nelsonville Historic Art District. It is lovingly restored theatre that reflects its glory days in 1879 through 1924 when it was home to vaudeville, melodrama, and minstrel shows. Stuart’s closed and sat empty from 1924 through 1976. In ’77 a group formed a non-profit and started bringing the theatre back to life when a devastating fire nearly destroyed the building in 1980. Seventeen years later, in 1997, the opera house re-opened its doors and is once again home to local, regional, national and internationally acclaimed performances. Stuart’s Opera House now hosts over 75 events a year and is Southeastern Ohio’s favorite place to experience live performance. Please join us! Stuart’s Opera House, 34 Public Square, Nesonville, 740-753-1924, 222.stuartsoperahouse.org Check the website for updated performance schedules as dates are constantly being added. In 1997 Matt Rapposelli and his wife Robbin Dewey established Big Chimney Baking Company located in Cannanville at a location which was the abandoned Cannan Coal Company, a property that had been split up between various owners since its operation from 1907 – 1930s. They were able to acquire the properties one by one with the vision of preserving many of the old buildings and giving them a new and useful life. The current property consists of the old company store, the shower and locker house, the payroll office, water tanks, and the 5 acre dammed water reservoir that supplied water for the mine operation which was steam powered, and of course the old chimney which still stands but is doomed for demolitions sometime in the future because of its deteriorating condition. It is their hope that some day a replica of the old chimney will be built on the same location to commemorate its existence and to help tell the story of the Cannanville Coal Company Town. Matt and Robin have collected many historical photographs of the mine in operation and recorded some oral histories from several of its former employees and their family members. The retail bakery, café and catering operation supply bread and pastries to the community surrounding Athens and specialty foods for large and small gatherings. They operate with 3-5 employees, some of whom are interns from local high schools and Hocking College. Their effort to secure and preserve the old company property as a historical site and give it a new life has taken a lot of hard work but it mostly has been an act of love, creating a sense-of-place enjoyed by their growing clientele, and connecting them to a grateful Cannanville community. After a yearlong renovation process, the Clermont County Park District has restored the historic powerhouse at the Chilo Lock and Dam #34 on the Ohio River in Chilo. The restored powerhouse now houses a visitor center and museum. The exhibits and displays found throughout the visitor center illustrate the theme “Living and Working with the Ohio River”. The Park District pursued several grants in order to make this park a reality. This wicket dam was completed in 1925 and actually operated until 1964. The powerhouse and accompanying houses had not been used for many years. The Park District had first established a 39 acre park and nature preserve with a wonderful view of the river on the grounds surrounding the abandoned buildings. Visit www.co.clermont.oh.us/parks for more info on the Clermont County Park District. The Greater Milford Area Historical Society, Inc. owns and operates the historic Victorian Italianate Promont House Museum. The house was built in 1865-67 and was occupied by Governor John M. Pattison, the 43rd Governor of the State of Ohio, and his family. Pattison was the only person from Clermont County to ever serve as Governor. The Promont House is listed on the National Historic Registry and has been restored to the splendor of the Victorian life style. The Haydenville Preservation Committee is a small group of volunteers that began meeting May 1994. The group organized to preserve the memories of the town of Haydenville, and to instill a pride in the rundown community. The Haydenville Preservation Committee became incorporated in 1997, continuing the original goals of preserving the history and heritage, plus encouraging pride in the town that was the “Last Company Owned Town in Ohio”. In 1997 the committee obtained a dilapidated company house to use to benefit the Haydenville community. This house was donated to the group by the late Quentin and Linda Cadd. It was decided that memoirs, photos, written history, samples of some of the brick, block and tiles, and copies of old newspaper articles could be shared with the public in a Museum/Community Center. The 1995 Historic Haydenville Calendar was developed to help raise funds for the organization. Old photos have been donated from as far away as Florida and the state of Washington to add to the collection owned by the Preservation Committee. This shows us that many past residents have a love of Haydenville. This fall the group put out their first attempt at a Haydenville Booklet with information and pictures of the areas’ past. Beginning in the spring of 1995 Committee members started clearing brush, cleaning up illegally dumped trash, and mowing the overgrown and forgotten Haydenville Canal Lock (#17) and planting trees nearby. Years of hard work and determination has created and maintained a unique Community Park. All mowing is done by committee volunteers. Picnic tables, grills and trash receptacles have been provided by the Committee for the enjoyment of all visitors. The group also sponsors community gatherings, youth activities, recycling drives, and provides 10 trash receptacles throughout town and pays for weekly trash pick-up. They are always looking for good community projects. From 1999 through 2004 the Haydenville Preservation Committee welcomed the Annual Haydenville Chautauqua. The Haydenville Preservation Committee is a small group of regular members, and is struggling to raise funds to complete the Museum, pay utilities and monthly trash pick-up throughout town, provide youth activities and promote projects to improve the community. You can contact the Haydenville Preservation Committee at P.O. Box 101, Haydenville, Oh. 43127. The project was made possible through various public and private sponsors including the Monroe County Economic Development office, the Governor’s Office of Appalachia, the Ohio Arts Council, Buckeye Hills-Hocking Valley Regional Development District, along with 20 other individuals, corporations and businesses. The Multicultural Genealogical Center in Chesterhill is a non-profit organization created to document the contributions of multicultural and multiracial families to the social, cultural, political, religious, educational and economic development of the Ohio River Valley. The Center collects written and electronic records that document the lives, histories, and genealogies of families in the region whose ancestries cross racial and cultural boundaries. It also educates members, visitors and the public about the lives, roles and contributions of those families and traditions to American society through community and educational programs. Working cooperatively with organizations, universities, agencies and libraries, the center members gather, share and preserve information and historic documents pertinent to the region. In addition, the Multicultural Genealogical Center recently purchased and is restoring a 1860s house in Chesterhill which is to be used as a meeting place, a place to archive documents and establish a library and research center. Donations and volunteers are greatly appreciated. The film “A Forest Returns” created by producer / director Jean Andrews and fellow producer / film editor Steve Fetsch is a winning documentary; a superb portrayal of environmental change in Southeastern Ohio that uses a masterful combination of techniques — including “first person” interview footage carefully linked with rare photographic images from the Ohio Hill Country past, and comparative views of the “same” landscapes today. Skillfully blending Ora Anderson’s eyewitness account with historical material and contemporary scenes, producer Jean Andrews has captured an important slice of Ohio’s New Deal experience. Jean Andrews won “Best Documentary” at the Second Appalachian Film Festival in Huntington in June 2005 for her MA thesis film. Jean also won The Best of Festival Selection (Student Film Maker Category) at the Berkley International Film and Video Festival, October 2005. The 29-minute film uses local newspaper editor/reporter Ora Anderson to recount the tale of the CCC coming to southern Ohio in the 1930s to create a forest where denuded land stood. It shows the desolation caused by a century of clear-cutting and strip mining and the current beautiful woods. “A Forest Returns” supports this insight by telling this little told story using Ora Anderson’s lovely narrative and an impressive array of visual documentation. This video is about the Wayne National Forest, the only national forest in Ohio. Its story is told by 93-year-old Ora Anderson, former newspaperman, lobbyist, conservationist, and bird carver, who was involved in the project, as a newspaperman and citizen, from its inception. His words are accompanied by imaginative video work, wonderful archive photographs, and soothing original music lyrics by Bruce Dalzell. It is a wonderful tribute to one of the great programs of the much maligned New Deal era. It also allows the remarkably articulate Ora Anderson, who personally planted 30,000 trees, to shine as a storyteller. Bruce wrote and performed all of the original music for the DVD, ‘A Forest Returns’. Bruce has been instrumental in the development, support and encouragement of local musical talent for more than 25 years in Southeastern Ohio. A singer, songwriter, solo performer, and member of a band, Bruce has long been a part of the establishment of the regional music scene. Bruce helped develop a cd for Passion Works from ATCO Sheltered Workshop and they use it as a fund raiser and to help raise awareness about the many and varied talents of citizens challenged with mental disabilities. As a piano tuner Bruce has been instrumental in the salvage and relocation and reuse of many a heavy old keyboard and helped keep these priceless pieces of our music heritage in operation and out of the dump. Bruce has hosted many an open stage program over the decades and has helped give many individuals the opportunity and the encouragement to perform and discover their own talents and in doing so has played an important part in the development of a regional heritage of music and musicians. David Martin at the Loveland Regional office of International Paper has worked with the GMAHS to help preserve the historic trees here at the Promont House Museum. We have recognized 10 very large old trees which have been measured and evaluated by arborists and the Ohio Department of Natural Resources. With the help of David and IP, we will be able to have some work done on the trees to try to keep them healthy and happy for many more years. The IP Foundation has a special interest in educating children. It is our intention to create a site map with the location of the trees indicated and information about each tree. We will give this information to our visitors including the Milford School District second graders who visit the Promont House as part of their history curriculum. A resident of Oak Hill in Jackson County, Lois has recently left her job with OSU Extension to spend more time with her family, husband Ty, and her quilting hobby. This “support service on loan” has continued through the 2005 Gathering by Mary Gulas who has assumed Lois’ work position in Piketon. After retiring from 20 years in the Food Service at Ohio University, Ida Mae Stoneburner jumped into community service with both feet. Starting up a Book Exchange Service on her front porch led to a Sewing Club in her home making items for sale to help the town of Glouster pay some of its expenses. Ida Mae helped found the Glouster Project making chicken door-stops out of old material and local paver bricks. The group’s logo was the Little Red Hen and the group’s motto was, “If no one else will help the town, then we will do it ourselves.” The Glouster Project, a group of mostly senior women, surveyed businesses and residents in an effort to make a better community. They recycled old clothing in to quilts sold to help pay local utility bills. The group acquired the old Glouster Train Depot for their headquarters. They saved and restored the depot and began cleaning and sprucing up the town, washing store fronts, windows and sidewalks. The Depot became the center for quarterly recycling collection drives and clean up activities including a clean up of Sunday Creek from where some fifty shopping carts and more than three hundred tires were removed. The Glouster Project always fed all volunteers participating in local service projects. Under Ida Mae’s leadership the Glouster Project held luncheons, dinners, ice cream socials, flea markets, and the sales of numerous items made from salvaged materials such as rag rugs, quilts, door-stops, stools, etc. helped raise money for community projects. The Glouster Project donated more than $100,000 to the local community through landscaping projects, paving of parking lots, restoring Village Council meeting rooms, making drapes, painting, planting flowers and helping to build the first Korea-Vietnam Memorial in Southeastern Ohio. Ida Mae and The Glouster Project repaired and restored the old town clock that stood decaying on the town’s main thoroughfare for more than 40 years. When the Verdon Clock Company in Cincinnati couldn’t restore the clock Ida Mae found local citizens to redo the entire artifact and found a local recycler who used an old Maytag washing machine timer to get it ticking again. Ida Mae Stoneburner, a lifelong resident of Glouster is 92 years old and she says “Recycling makes a cleaner and better community.” Heritage is developed and preserved in many little ways. For her unwavering dedication and commitment to the heritage in her community and her inspiring leadership by example. Known by many from his website as “The Olde Forester,” Emmett Conway has spent a lifetime researching and tramping the hills and fields of Ohio’s Hill Country seeking out its vast treasures. Upon discovery, in every case Emmett has turned around and made extraordinary effort to share this wealth of history and heritage with anyone who would take the time to hear him. From the underlying geology and the vegetation covering it to the early traces on its surface made by buffalo and elk and native peoples; from the moundbuilders to the first economic endeavors by pioneers in the fur and salt trades; the iron furnaces, stagecoach roads, canals and railroads; it has all been grist for Emmett’s mill. And mills too! He knows where they were. It’s all a form of poetry to Emmett and he has been known to put it in verse and wax eloquent on it more times than we can fathom. He may have gotten an important part of his education at a school in Michigan but he put is knowledge to work for the good of Ohio, especially Ohio’s Hill Country. Emmett was the first Park Ranger in Ohio’s first State Park at Lake Hope. He has taught natural history, Ohio history, and geography to many, sometimes on a payroll but most often as a volunteer who just couldn’t keep it to himself. His love and enthusiasm for a wide spectrum of Ohio’s rich heritage is contagious. He has infected many. His legacy grows through his unnumbered students of Ohio’s heritage who have caught the bug and continue his pursuits every day. For his gifts of wisdom, teaching and recording the heritage of the Ohio’s Hill Country Region. Probably the most familiar voice in Ohio’s Hill Country and one of three most distinctive voices in radio for many in our region after Wolfman Jack and Paul Harvey, John Ray has been a part of the area’s culture and heritage for more than forty years. In addition to being a consumer ombudsman, a news reporter, a correspondent, and an ever faithful advocate of public radio and television, he has interviewed thousands of local, regional, state and national individuals and representatives of programs and organizations helping them get their stories to the public. John has been involved with Ohio’s Hill Country Heritage Area since the inception of the concept. He has been an unwavering ambassador for Appalachian Ohio and has helped bring a better understanding of the culture through a decade of guest speakers at the Ohio Appalachian conferences through his “Afternoon Edition” program on WOUB. John is one-of-a-kind, a hard act to follow, and an man who is at the top of his game; a master of his craft, a class act, an institution; a fine and humble human being; and a gentleman in every respect of the word. His contributions to his community and beyond are many and varied; he as received many honors acknowledging that work. Through his professional work and his personal commitment and sacrifice, John has helped make southeastern Ohio better than he found it. He is part of the fabric and heritage of his community, the region, and of Ohio’s Hill Country Heritage Area. John himself is a heritage resource. John Ray has recently “signed off,” retired, from a nearly forty-year radio career with WOUB, Ohio University Public Radio where he served as senior radio producer; its radio production studios have been named in John’s honor. It was a privilege for Carol to be part of the creation of Ohio’s Hill Country Heritage Area. She felt great energy throughout the process as she attended many meetings throughout and almost 3-year process. Carol describes that time as “the best bottom-up process” she had ever experienced, an effort that moved meetings around the region and involved ordinary citizens, honored local knowledge and provided a mechanism for people in their communities to become involved. As Executive Director of Rural Action since its creation, Carol was able to apply the principles of sustainability locally. Sustainable development begins with a deep knowledge of our home place. The environmental and cultural heritage of the region form the asset base for all other development efforts. So often our society, through its economic development efforts, destroys that bio-cultural base and therefore its “development” is unsustainable. Rural Action’s commitment is to engage citizens in knowing, preserving and developing sustainability, its environmental and cultural assets. To be engaged in that process with so many people has been a joy. One of Carol’s major accomplishments at Rural Action was the development of the mural corridor that includes twelve murals and spans five counties. Carol had a commitment to involving the arts and heritage of the region in all of Rural Action’s projects resulting in the creation of “Fine Times at Our House” traditional music CD, the video “Lights in the Darkness” about teen depression and suicide prevention, oral history collections, and participation in the Countdown to the Millennium project and “This Time Around” radio series. To be engaged in all of this with so many people has been a joy. Carol retired in January but remains n peace and justice issues both here and abroad. For her efforts in establishing Rural Action. Doug has been mayor of Crooksville in northern Perry County sine 1994. He is a retired history teacher and long time school board member in the Crooksville area. Doug has implemented a diverse, long-running revitalization effort in Crooksville by spearheading a local history group, a village tree commission, the Moxahala River Watershed Committee and several other local groups made up of local people working to spur sustainable economic development and to improve the quality of life for the people of Crooksville. These groups have grown the thriving annual Potter Festival and other community events and programs. The history group has collected, documented and shared local history and established a museum and community center in an old school building to showcase local history. The Tree Commission has planted trees and transformed an abandoned truck storage area into a downtown pocket park with trees, flowers and a fountain. The Moxahala Watershed group has planted trees, cleaned up litter, held recycling collection events and provided education and awareness to local residents about living in the watershed. Under Doug’s leadership, Crooksville has become a Tree City USA community and nicer place to live and work. For his dedication as Mayor of Crooksville Ohio in valuing, promoting, and preserving the heritage in the community. A resident of Washington County for more than 60 years, Henry has been a leader in raising awareness about local an Ohio history, not the least of which have been his efforts regarding Ohio’s heritage relative to the Underground Railroad in the 19th century. Henry has done considerable research into this rich but largely undocumented and uncelebrated story of the Underground Railroad and the families and people associated with probably the most notable aspect of our American heritage. Henry has authored a number of books, most notably The Escape of Jane, the story of one woman’s experience with slavery and her dramatic flight to freedom. Henry is the foremost authority and spokesperson for this, until recently, neglected part of our local history. Henry is a history lecturer and he writes a newspaper column on local history and the Underground Railroad. He serves on the Underground Railroad and Civil War Advisory Council and is the South East Coordinator of the Underground Railroad Association. Henry strives to share his interest and enthusiasm for our heritage with others. And, very importantly, Henry is an advocate for the preservation of historic sites and structures that held so much meaning in our past and which offer so much wealth to our future. He has helped to get historic markers placed and helped to lend a sense of importance and significance to several otherwise unknown parts of our past. Since 1982 Charlotte and Tom have been involved in the revitalization of a small town known as Deersville Ohio in Harrison County. Over time they purchased numerous houses that were “sad old buildings”, which were ready to bulldoze and transformed them in to show piece restorations, doing most of the hands-on work themselves. One home received an Honorable Mention by Good Housekeeping Magazine for Home Restoration in the year 2000. The restored houses are now available for rent overnight and weekend guests. Their enthusiasm was encouragement for others to purchase and restore some old abandoned houses that have since become Bed and Breakfast Inns and a restaurant. They are currently restoring the Union Hotel building which is the last remaining hotel in Deersville which was once a thriving center for commerce and trade in the 1800s. They have been instrumental in exciting others to recognize the value of preserving and protecting the architectural heritage in the beautiful but threatened little town that is typical of many small towns in Ohio’s Hill Country Heritage Area. Their guiding efforts and enthusiasm was instrumental in Deersville becoming an Official Historic District on the National Register of Historic Places. The Bells were also instrumental in organizing the Deersville Improvement and Historic Preservation Society that maintains a thriving theater with regular occurring events that attract patrons from many miles around, in obtaining a Bicentennial Historic Marker commemorating two local area citizens, and played a significant part in establishing an Annual Founders Day Festival to celebrate the agricultural and small business heritage or the area. It would be a mistake to underestimate the influence the Bells have had on preserving homes and other architectural treasures and the spirit of Deersville. Several other home owners have restored houses based on the fact that Deersville is “coming back”. The Bells have played a big part in turning the tide keeping this beautiful little town economically alive while preserving its sense-of-place. The Bells have indeed made history in Deersville, Ohio. Building on more than 135 years of successful youth leadership programs, the Ohio-West Virginia YMCA is creating a nationally significant Center for Community Leadership at Cave Lake near Latham in Pike County, Ohio. Cave Lake’s 700 acres include forests, limestone cliffs, wetlands, caves, a 42-acre lake and more than 150 species of birds, 160 species of trees and shrubs, and 360 species of blooming plants. The cave is environmentally very important as it houses three species of bats, the Sullivantia sullivantii plant and the Frost Cave Isopod, a rare crustacean. The Ohio-West Virginia YMCA’s Hi-Y, Youth in Government, Model United Nations and Camp Horseshoe programs will be significantly expanded and new initiatives added at Cave Lake. Programs will focus on stewardship of our natural and human made environments, civic leadership, the arts, entrepreneurship and community building with a goal of strengthening the base of civic leadership for our communities, states and nation. For more information or to arrange a tour of Cave Lake, please call the Ohio-West Virginia YMCA at 937-588-3252. The Harrison Coal and Reclamation Historical Park, an Ohio coal and surface mining museum project was founded in 1992. The purpose of the organization was to form a heritage and preservation organization with a major goal of preserving Ohio’s surface mining heritage and acquire The Silver Spade, a 105 cubic-yard Bucyrus-Erie 1950-B stripping when retired from service. The Silver Spade is currently the only shovel of its kind operating in the United States. The organization has acquired many pieces of surface mining related machinery since 1994. The organization’s machinery was recently relocated to its new location along Ohio 519, between New Athens, Ohio and U.S. Route 22. Over the past two years the organization has acquired a Marion 111-M crawler dragline and most recently was donated an early 1950’s Marion 7200 walking dragline located in southwestern Carroll County. The Marion 7200 will be relocated to the new Harrison Coal and Reclamation Historical Park grounds for preservation and future restoration. The relocation project will involve volunteers from over 4 states and the organization is currently raising funds for transportation costs. The short and long-range goals of the organization are to have the new grounds officially ready for the public by the summer of 2005; restore some of its machinery; increase interest in surface mining heritage preservation, membership, volunteer interest; generate more funds for its mission and carrying on with its mission to acquire The Silver Spade when retired from service. The organization has an international membership. If you had asked Karen 15 years ago what she would be doing today, she would never have answered “restaurant owner.” But for the past three years Karen Hill has owned and operated Karen’s Kitchen, a family restaurant on Main Street in New Straitsville. The establishment is a friendly place where town folk gather for a cup of coffee, a sandwich, or a full meal. Daily dinner specials are her trademark, especially the all-you-can-eat fish dinner on Fridays from 4pm to closing. 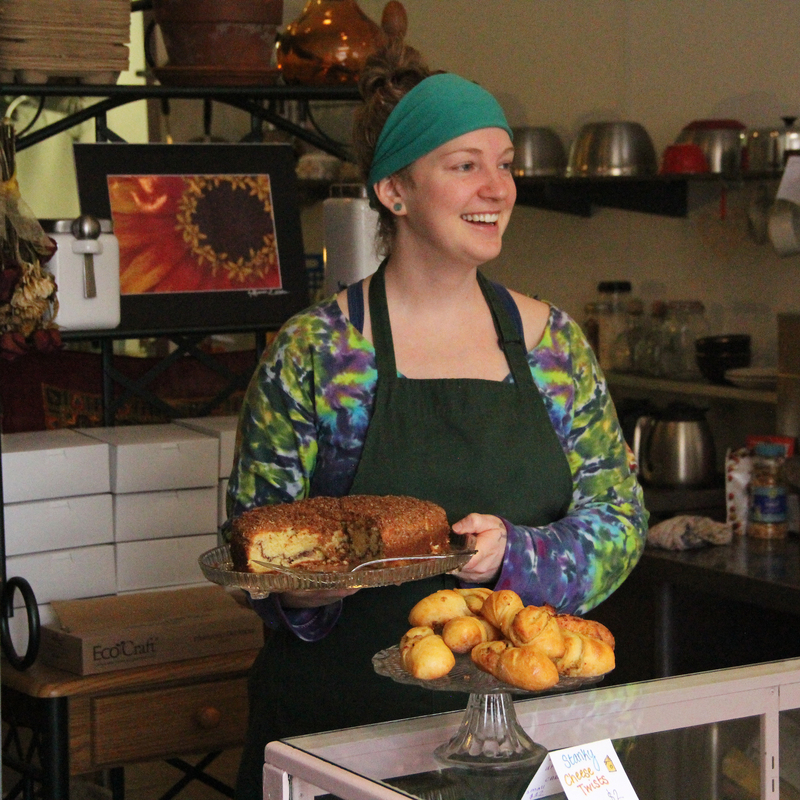 Several local bakers provide her with homemade pies and local gardeners share seasonal fruits and vegetables that make their way into the meals of her customers. Karen says knowing her customer is the most important part of her work and what keeps her going. She knows her “regulars”. If she does not see them for a day or two, she will call to check on them. Often, regular customers let Karen know if they will not be in. History has been preserved at this landmark with old wooden booths made by Nellie Ward, former owner and longtime New Straitsville resident and old photos of the Wards and other important people and events of New Straitsville history. The local history group museum is next door; Karen will open it to customers interested in looking a the museum treasures. She promotes area tourism and cultural heritage through brochures of local and regional events and by selling books written by local authors. 1940s-style shelves and display areas, said to be from an old cruise ship, hold commemorative plates from every Moonshine Festival. A recently revised menu reflects the history of “mining, shining and drilling” with “Roust-about” and “Fire in the Hole” main dishes and a “Gob Pile” dessert. She hopes to have a website in the near future. The Athens Farmers Market (AFM), founded in 1972, operates an open-air market for producers of food and flowers. It has grown from very humble beginnings to a thriving, year-round market with strong support from the local community and local producers. Summer and fall Saturdays see from 2,000 to 3,000 customers visiting 50 to 60 sellers offering a large variety of fruits, vegetables, flowers, meats, baked goods and prepared foods. Wednesday market days are also offered from spring to December. You can visit AFM at our 10am to 1pm Wednesday and Saturday markets or at our website www.athensfarmersmarket.org. The AFM, an Ohio non-profit corporation, operates on a small budget with low vendor fees that encourage small producers to enter and grown in our local food economy. AFM members meet once or twice each year to review market developments and elect officers from among the market members. We hope that future developments and allies will help AFM to gain more security and a permanent location with a shelter for our market. The Tecumseh Theater building was built by the fraternal organization “The Improved Order of Red Men” in 1907 in the historic boom-mining town of Shawnee in southern Perry County. The four-story building was called a skyscraper at that time and is still the tallest building in Perry County. The first floor storefronts supported the full size opera house with balcony seating on the 2nd and 3rd floors and Red Men Headquarters on the fourth. A movie theater operated on the first floor from 1925 to 1960. As the coal boom decline in the Little Cities of Black Diamonds region so did the use of this building. Its last public use was in 1960. In 1998, as aging but sound school buildings were being demolished around the state of Ohio, the Greenfield Board of Education and the citizens of Greenfield lobbied the Ohio Schools Facilities Commission to save the buildings on the McClain campus from destruction. Because of the significance of the building it was saved. McClain High School was completely renovated and continues to serve the students of the community with a classical education and stands as a remarkable piece of Ohio’s education heritage and a shining example of how community spirit can help make our wealthy past a part of a healthy future. The Athens County Commissioners recognized a need to restore the long neglected Athens County Courthouse. In spite of difficult funding challenges and the risk of partisan criticism the commissioners demonstrated political courage by deciding to seek the funds necessary to protect a valuable heritage resource in the community. Repairing and restoring the Athens County Courthouse serves as an example for other local government agencies and an inspiration to area residents and businesses. Conceived as a Town Hall and Opera House, it was built between 1890 and 1892, and continues as a McConnellsville landmark. The Opera House is a masterpiece of stone brick and red oak. In its early years, people came by railroad cars from all over Southeast Ohio and packed the 800 seat theater. It became the center of community life with medicine shows, minstrels, magic shows, musicals, Shakespeare tragedies and Billy Sunday revival meetings as well as campaign speeches and vaudeville shows. In the early 1900’s, silent movies came to the theater. The Great Depression brought hard times, but the theater continued with live shows. Major renovations took place in 1936, 1973, and 1984. It is now listed on the National Register of Historic Places. In 1992, the Opera House was sold to the Board of Trustees making it a non-profit organization. Looking to the future, the mission is to restore the building completely for program expansion and tourism, to continue first-run movies, and to create a professionally directed amateur children’s community theater for the education of children and the enrichment of families in to the 21st century. The MarKay theater project was one of restoration and renovation of a 1930 movie house abandoned in the early 1990’s. The building fell in to disrepair and in 1996 it was given to the City of Jackson and the Southern Hills Arts Council that signed a long-term lease to renovate, maintain, and operated the building. The renovation was designed for completeion in phases. A variety of funding sources and volunteer efforts have been involved. Public events and activities have been occurring since early on. Six relief sculptures that once graced the walls were restored and remounted. Theater seats will be custom made. The old boiler room under the stage was transformed into dressing rooms, a new roof, ceiling, walls, floor, box office and technical booth were completed before an Open House reception in July brought in over 500 guests to tour the renovation progress and many provided oral histories. Stately old trees lining residential streets are one of the first and lasting impressions on anyone passing through Ohio’s first organized settlement, Marietta. On closer inspection one can see hundreds of recently planted trees on street after street that will become the stately trees of Marietta’s future. The Marietta Tree Commission has struggled with some very obvious success for decades to ensure that a healthy urban forest compliments the historic built environment of the community. In an era when the importance of trees is so often overlooked and trees are so commonly removed as the first step in expansion for economic development, the Marietta Tree Commission has worked to ensure that trees are a partner in development schemes. Since the year 2000, Marietta has seen more than a thousand trees added to the community. Tree planting and tree care is not cheap. More than a hundred thousand dollars was spent in the effort. This tremendous investment demonstrates a real commitment to make trees an important part of the legacy of the community. Marietta stands as a model in blending the care of the natural heritage of trees with the heritage of the built environment of growing communities in Ohio. For work of protecting and preserving the natural environment in the context of the Built Environment. They saw the treasure in our trash bins. A number of years before the state legislature even began to consider the growing problem of resource waste in the state of Ohio, a group of dedicated volunteers in Marietta were giving up their Saturdays and evenings putting together a program that offered local residents an alternative to burying our legacy of natural wealth in local garbage dumps. Since 1976, four years before the state began providing funds to pay for staff salaries, equipment and educational programming, around the state, Marietta had an aggressive group of unpaid workers already on the job. Nearly thirty years later this still unpaid group of volunteers, some of them the very same people, are still giving up their own time and resources to operate an unfunded recycling program that enjoys the participation of thousands of residents. Thousands of tons of the nation’s resources have been diverted from local landfills and have been directed back into industry as feed stock for new manufacturing. In the past five years alone this group of volunteers has been responsible for the conservation of more than 3200 tons of mineral and forest resources and the enormous amount of energy that would have been required to replace and remanufacture these materials. This is no insignificant undertaking and the consequences of their work, although hidden to most of us, represent a significant positive impact on the economy, the environment, public health and national security from which we all benefit even though we may live elsewhere. “No one can pack in the corrugated like our volunteers, Brad Bond, George Cady, Jim Noe and Fred Wood—the major loaders. If it were an Olympic sporting event they would all tie for the gold”. “Mildred Cady has been head of the plastics for years—I don’t imagine very many people in the state have personally handled as many plastic containers as she has in the past 20 years.” Volunteers doing what is not very glamorous but what is fundamentally very important.